The initiatives that started in 2011 have paid off immensely as demonstrated by the School’s accelerated rate of academic improvement and achievement. 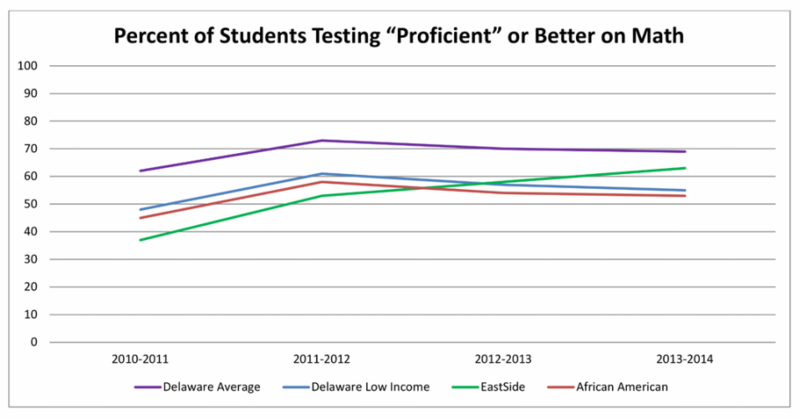 EastSide has now achieved “Adequate Yearly Progress” (AYP) for four straight years, the percentage of our students scoring proficient or better has increased dramatically and our growth has significantly outpaced the improvement demonstrated by all students statewide and by all low income students statewide. Impressively, while 87% of EastSide students are classified as low income and 20% are classified as special education, over 75% of our students met their academic growth goals in 2013-2014 according to Department of Education indicators. The graphics below show the percentage of students scoring proficient or better on state mandated (DCAS) exams at EastSide over the past four testing cycles. EastSide students have made a 30 point growth in reading and a 26 point growth in math proficiency over this period. In addition to measuring proficiency, the State also tracks student performance throughout the year via annual growth goals. The graphics below show the percentage of students meeting their annual growth goals on DCAS exams at EastSide over the past four testing cycles. EastSide students have made a 35 point growth in reaching these goals in each reading and math in the past four years. As is referenced above, nearly 20% of EastSide students are classified as special education. Four years ago these students were some of the lowest performing students at the school. The graphics below show the 27 point growth special education students have made in reaching both reading and math proficiency over a four year period. 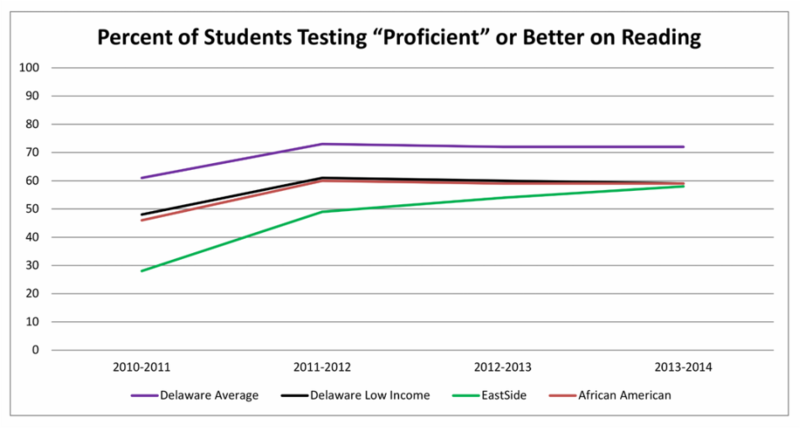 The two graphs below compare the growth at EastSide with Delaware’s overall average as well as the statewide average for all low income and African American students. In reading, EastSide has grown by 31 points since 2010-2011, compared to an 11 point growth statewide and 12 points in low income growth statewide. While the State in general has not seen growth since 2011-2012, EastSide has continued to grow. Significantly, EastSide has decreased the achievement gap from 33 points in 2010-2011 to 14 points in 2013-2014, a 19 point reduction! Finally, in math, EastSide has grown by 26 points since 2010-2011, compared to a 7 point growth statewide and 7 points in growth statewide by all low income students. EastSide has surpassed the low-income averages and is fast approaching state averages. Significantly, EastSide has decreased the achievement gap from 25 points in 2010-2011 to 6 points in 2013-2014, a 19 point reduction!